Unexpected readers can be guided by unexpected “conduits”. On the web, curation is partially “decentralized”. Our fourth anomaly occurred on a Reddit forum (https://www.reddit.com/r/AskReddit/comments/68chuk/whats_a_lpt_from_medieval_times/). A user asked for advice (“life pro tips”) to survive in the distant (“medieval”) past. One of the 1400 responses pointed to a curious experiment conducted by the Hypotheses research blog Recipes (recipes.hypotheses.org/1410): recreating Frederick II’s breakfast, namely “beer soup”. This ancient dish, the experimenters conclude, is “repulsive”. This decentralized curation is not uncontrolled. Many anomalies seem to come from Facebook, generally from recommendations in themed groups. This reception is, however, very inscrutable: logs from Facebook do not indicate the exact URL. The social network’s tight control over its data contributes to obscuring the channels of reception. This reception is, however, very inscrutable: logs from Facebook do not indicate the exact URL. The social network’s tight control over its data contributes to obscuring the channels of reception. 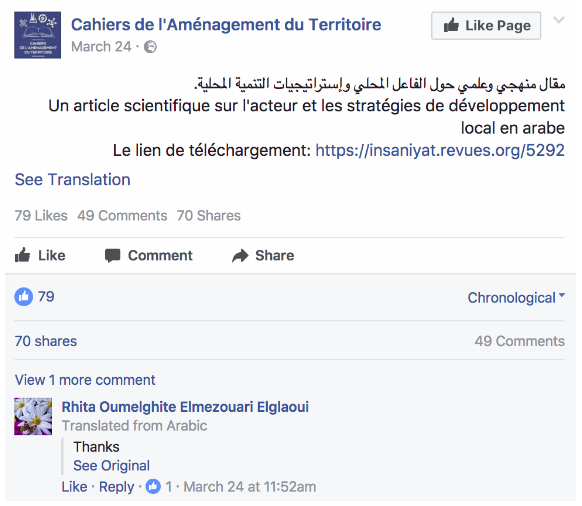 For example, on 20 March several dozen Facebook users visited an article published by the journal Études photographiques (http://etudesphotographiques.revues.org/210): we have been unable to identify the source of these visits.